I Bought a Kindle…Great, What’s a Kindle? I am not a traitor to my kind. Let me explain! I have a background in Library Science. This means that one day you could find me in a library somewhere, sans librarian’s hair bun and pointy glasses, with my nose in a book. I love books! Their smell. The feel of a book as the crisp edges brush against your fingertips. I like looking at the due dates — sometimes books haven’t been taken out of the collection in years! Imagine being the first person to discover a little-known book that’s not been off the shelf in decades. 🙂 It’s quite exciting for a bibliophile like me. Ooh, and finding bookmarks people have left. Have you ever noticed how much a bookmark can tell you about a person? I collect bookmarks. My friends know I love books. I am a proud Borders Rewards member. I fully expect someone will give me a gift card to my local bookstore in my Christmas stocking in another month. So what’s the fuss then about a Kindle? Well, let me explain… Some people don’t know what a Kindle is. A Kindle is an electronic book reader. If you’ve seen the commercials for Apple’s “iPad“, you might recognize the similarity to the product. They’re actually quite different. 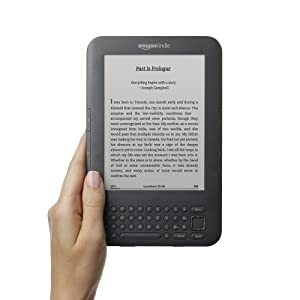 The Kindle is a product by Amazon, more closely linked to its competitor, Barnes & Noble‘s Nook. And, the running joke of course is, B&N needs to come out w/ a series of covers for their product called “Crannies”. Rim shot please! I have nothing against books. I am interested in the changes and conveniences that new technology can bring and am excited to explore this new product that’s actually been on the market a couple of years now. The photo featured here is of their 3rd generation wi-fi-only, 6″ version in Graphite, priced at $139.00. Sure, I can and will keep reading books. But, imagine being able to fit over 3,000 books in one potable device! That’s more than most people’s personal libraries — even the other bibliophiles I know. Amazon’s also delving into the Apps market, with subscriptions to newspapers, magazines, and even games. There’s a lot of free content I can’t wait to get my hands on too. The Gutenberg Project started some time ago has made books out of print now more available in an electronic format for the general public. This means that a book that there might only be 1 copy of, stashed in a dusty shelf somewhere, now may have a new lease on life in the virtual world. The possibilities are endless. It’s also lightweight. I’m getting to the age where I shouldn’t carry 30-40lb. of books around all day/night. The Kindle (excluding skins, covers, or other protective elements) weighs 8.5oz. (that’s less than a paperback). So, that’s a brief review of what a Kindle is what it can do. I’m planning on experimenting with it once it arrives and I’ll post and let you know what the pros and cons are of the product.